One of the reasons Tona and I postponed our Makers Market from this Fall is because there is plenty already going on. From every angle, there’s lots of competition for time, energy, and shoppers’ money. If there’s one thing I have learned in my (nearly) 28 years, it’s not to rush a process. Waiting until the springtime allows us to scope out other markets, do some reconnaissance, and meet potential vendors. The Oxford Exchange held a gift bazaar last year around this time, and repeated this year, with a similar layout and group of local vendors. I meant to peruse it on Saturday, but didn’t get there until an hour before closing on Sunday. Luckily, the universe was in my court and, as I was tasked with finding a living wreath earlier in the day, who would be the first vendor to my right as I walked in, but Lindsey Easton! I’d never encountered her flora before, but the smells were exquisite. Woody, with pine and fresh grass. Her booth matched, made partially of what looked like reclaimed wooden barn slats. Apparently, she has an entire farm outside of Tampa. Most people don’t even consider it, but many of our flowers come from South and Central America, or from Asia, much in the way that non-local foods are imported from sources thousands of miles away, driving up the environmental impact + cost. That process also puts downward pressure on product freshness and largely cuts out local economies. In the food world, “farm-to-table” has become popular for just these reasons. 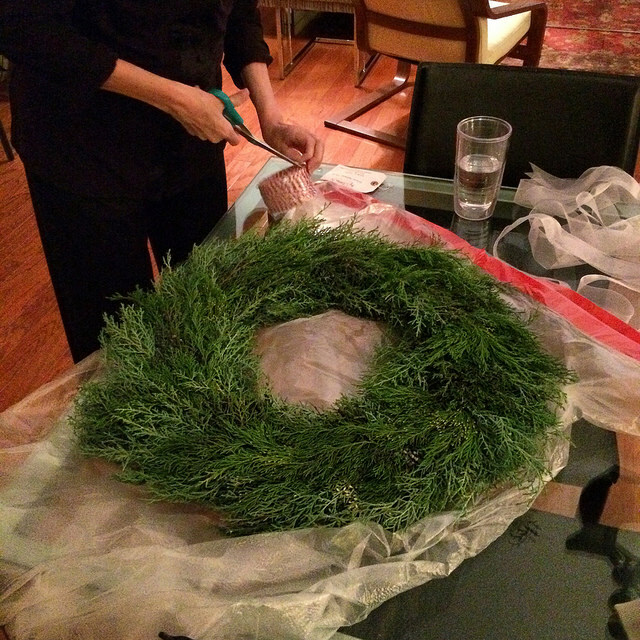 In any case, I am smitten with the wreath, and happy to have met Lindsey. I didn’t purchase anything else at the bazaar, but did collect a handful of business cards.